Christians are called “Worshipers of the Cross by Muslims. Why? Because we show such reverence to the crosses we wear and put up in our churches, in remembrance of the one on which Jesus died, and we put them atop our churches. Today in Wenzhou, China, the city with the highest number of Christians in all China, crosses are being lopped off church towers all over Zhejiang province – nobody will give an answer as to why, but obviously some Communist high up in the ranks is seriously offended by the number of crosses out there. And of course in regions ruled by ISIL/ ISIS, not only are crosses being knocked off church towers and churches claimed as mosques (Syriac Orthodox cathedral of Mosul and 44 others http://www.aina.org/news/20140729100528.htm ) but Christians of all Churches have been crucified on new crosses. The enemies of Jesus both hate His cross and are disturbed by its claims: that the Word of God took flesh in the womb of the Virgin, became one of us, lived among us and worst of all He died for us out of love! September 14 is the feast of the Exaltation of the Cross. Honored as the life-giving Cross, since through it Christ gives us eternal life and lifts us up to Him Who was lifted up on Good Friday for our redemption out of His great love for us; and also because when the True Cross was found by St. Helena, it was touched to the body of a man being taken for burial and he was instantly revived. During the Vigil, a cross is placed on the Holy Table/ altar where it reposes during the Vigil. 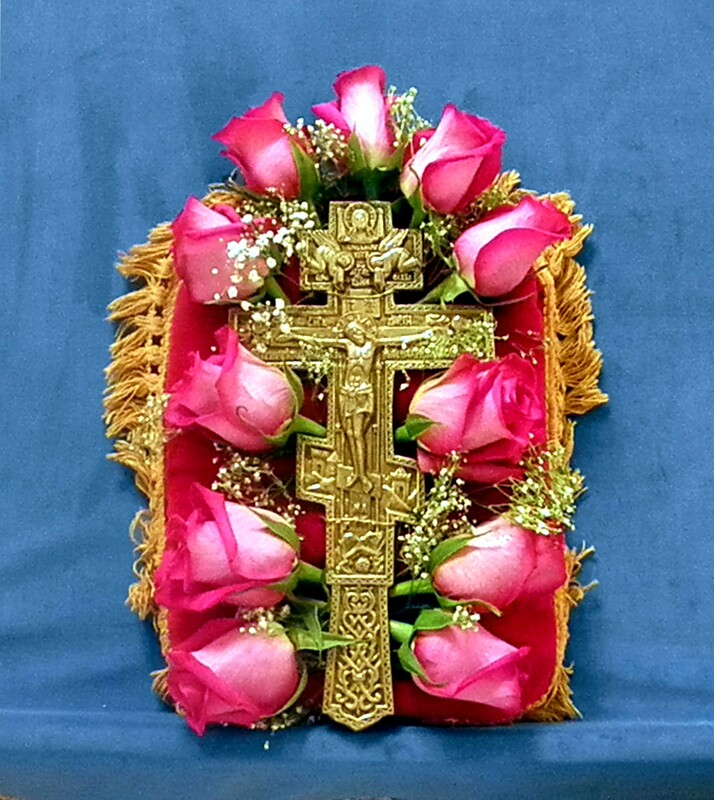 This cross is placed on a tray that has been decorated with fresh basil leaves and red flowers. The cross reposes on the “High Place” of the Holy Table, where the Gospel Book would normally be. Basil is used because this plant’s name means “king” and Jesus is our true king, and because it is associated with Mount Calvary, where our Lord was crucified. At Matins, the transfer of the Cross takes place. After the Great Doxology the priest brings the Cross out of the sanctuary, led by candle-bearers and the deacon with incense. He sets the cross on the tetrapod which always stands in the center of Byzantine-Ruthenian churches as the choir sings: We bow to Your Cross, O Lord, and we glorify Your holy resurrection. This is what baffles Muslims and Communists: how can we Christians believe in such a link, and why must we put our crosses in front of them to disturb their consciences? The special “Exaltation” is then celebrated, echoing the one done in Jerusalem. This consists of the priest taking the cross in his hands and lifting it above his head. At the prayer sung by him or the deacon, the people sing “Lord, Have Mercy”. As they sing, the priest slowly blesses the congregation, and then bows down to the ground and up again, lifting the cross on high. This process is repeated four more times to the four points of the compass. Everyone bows during the singing of “We bow to Your Cross, O Lord” and stands up at the following verse “and we glorify Your holy resurrection. The cross will remain in the center of the temple throughout the octave and the faithful will venerate it whenever they enter or leave the church. Finally, on the leave-taking of the Feast, the priest and deacon will cense around the cross, there will be a final veneration of the cross, and then they will solemnly bring the cross back into the sanctuary through the Royal Doors. 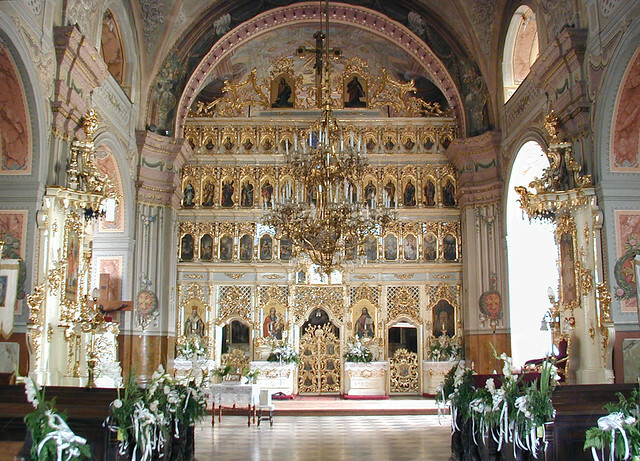 Many churches are named in honor of this feast, the most important to our Church being the Cathedral of the Mukachevo Eparchy, the mother diocese of the Byzantine Catholic Metropolia of the United States (to which we belong), in the city of Uzhhorod. In this cathedral, a special reliquary with a sliver of the True Cross is exposed in a glass-enclosed box over the Royal Doors of the iconostas. Put on a cross around your neck and thank God that you can do so, and kiss it. Hang a cross on a wall of your home, and do the same. Above all else, pray for those who have lost everything because they honor the Cross, and those under Communist rule who are willing to go to prison, for the sake of the Cross. The enormous Sanjiang Church was completely torn down. Despite having had all the government permits, it was declared “illegal”, and in a Communist country, the government’s decision cannot be appealed, no matter how wrong it is.